Thailand is one of the famous holiday destinations in the Southeast Asia region. With over 1,400 breathtaking islands, modern cities, the majestic natural landscape in the northern part, and friendly Thais, it is no wonder to see travellers and backpackers flock this country every single year. But, how well do you know this “Land of the Free”? 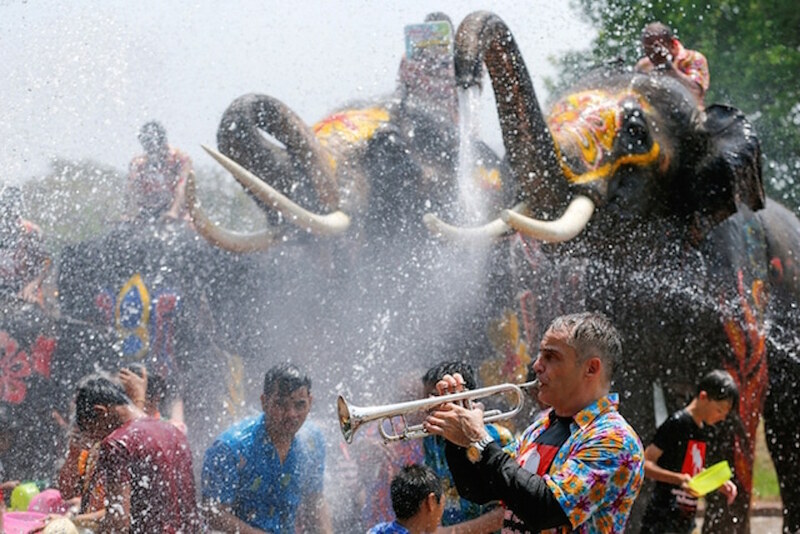 Here are the 7 interesting facts about Thailand that 87% of Muslim travellers don’t know! 7 interesting facts about Thailand that most Muslim travellers might not know! The Thais speak their language super fast as if they are talking in a single breath! But, if you pay attention, most of the words are very familiar. This might be one of the interesting facts about Thailand that you don’t know! For example, you can use common English words like taxi, toilet, clinic, hotel or guest house when speaking with the locals, asking for directions, and what not. Learn some of the following words while having a holiday in Thailand. The locals love foreigners who speak their language. How much? – Nee Tao Rai? The additional word (Krub/Kaa) is used at the end of the sentence depending on the gender of the person you are talking to (like the Arabic language!). Use Krub or Kup if you are talking to a man and Kaa when it is a lady. Mr. & Mrs. Halal Tip – Learn the greeting custom of the locals called The Wai. How? Place your two hands together and give a slight bow while at that. With this kind gesture and effort to speak their language, you will find it easier to find your way to the famous floating market Damnoen Saduak in Ratchaburi. 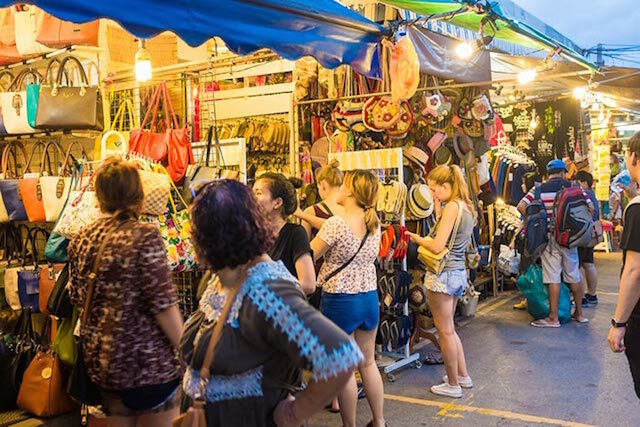 Also, use it to get a bargained price for exotic trinkets and accessories while shopping at the world’s largest weekend market – Chatuchak Night Market. Do you know that Thailand has over 5,000 miles of coastline all together? This fact might be one of the interesting facts about Thailand that you don’t know! Out of them all, Phi Phi is considered as the superstar island. It has been featured in countless movies and yet still maintains its natural ambiance. 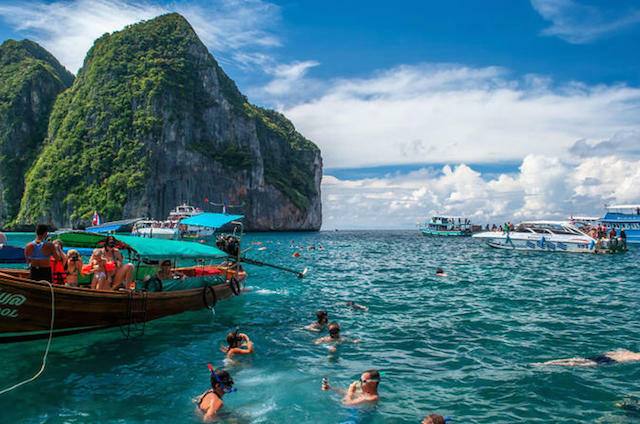 One of the things 87% of Muslim travelers don’t know about holidays in Thailand is that, besides Phuket and Krabi, Phi Phi Island is a destination that you should not miss. There are two parts of the island – Phi Phi Leh and Phi Phi Don. The former is free from human inhabitants, and the latter is a car-free island. To get there, you will need to take a longtail boat! & Mrs. Halal Tip – When riding the boat, you might have to take off your sandals. So, make sure you wear your most comfortable sandals to avoid hassles of wearing and taking off your shoes. Snorkeling, swimming, and relaxing on the beach are some of the activities you can do here. 3. Tuk-Tuk Offers the Ride of Your Life! Sure, you can always opt for the air-conditioned taxi, but no trip to Thailand would be complete without an adventure in a Tuk-Tuk. 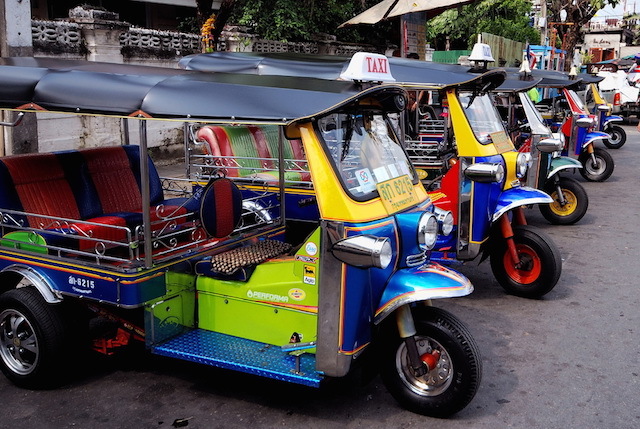 One of the interesting facts about Thailand that most Muslim travellers don’t know is that riding a Tuk-Tuk is one of the best ways to get around in Bangkok city. You can chat with the friendly driver, have a clearer view of the street sights, and arrive at your destinations in no time. For the Muslim ladies, hold on tight to your scarf as it can get a bit windy as the vehicle surfs speedily on the road! Mr. & Mrs. Halal Tip – Always negotiate with the driver about your destinations and its fee before hopping on the tuk-tuk. One of the interesting facts about Thailand that 87% of Muslim travellers don’t know is that Halal food options are quite abundant, especially in Bangkok. 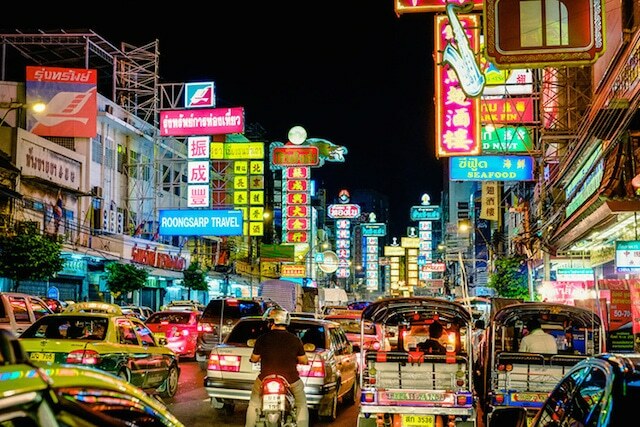 Head over to one of the busiest streets in the city, Sukhumvit Road, and you will be surprised to see many Halal food stalls and restaurants in this area. Alif Laila by Bawarchi restaurant, for example, serves delicious Halal Punjabi foods and Beirut Restaurant will allow you to enjoy tasty Mediterranean dishes. 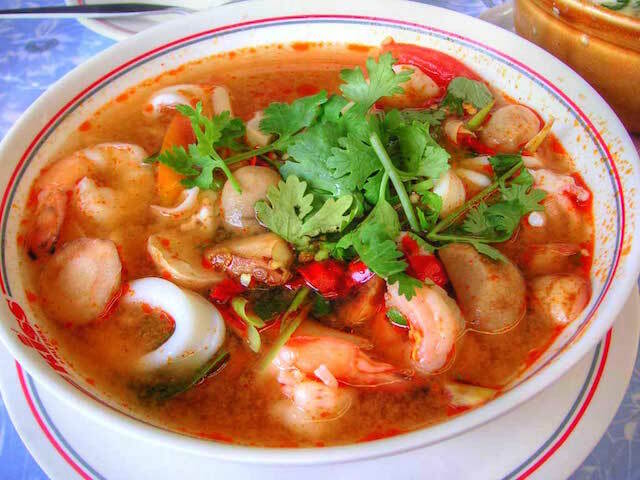 If you would like to have a taste of real Thai cuisines, head over to Usman Muslim Restaurant (Their Tom Yum Kung? It’s to-die-for!). Other areas that offer Halal foods are Ramkhamhaeng and Phetchaburi. Unlike the hustle and bustle of Bangkok City and the gorgeous beach lifestyle in the southern part of Thailand, the northern area offers an entirely different atmosphere. Here, you can enjoy elephant rides, hill trekking, and visiting old temples. 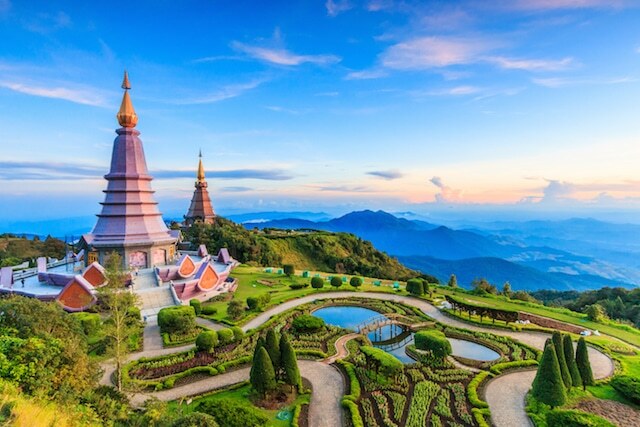 Chiang Mai is the most famous city in this northern region, and there are about 300 temples in this city alone! Mr. & Mrs. Halal Tip – Remember to take off your shoes before entering the temples as most of these sacred sites require you to do that! While in Chiang Mai, make sure you have a stop at one of the night markets (e.g. Chiang Mai Bazaar) to purchase antique findings, silverwares, and traditional handicrafts. These treasures might not be found in the night markets in Bangkok or other cities in the south. Another thing to do while having a holiday in Thailand is to visit its Chinatown. Now, before you roll your eyes thinking that it is a cliché destination, hear us out: it is one of the biggest Chinatowns in the world! Located on the Yaowarat Road, it is the oldest area in Bangkok. You will be able to walk around and enjoy the lively scenery of this place. Mr. & Mrs. Halal Tip – You can take an MRT train and stop at the Hua Lamphong station to get to Chinatown. Wander the small alleys and have a stop at one of the old shop houses selling all sorts of things. Bangkok’s Chinatown is also famous for its street foods. Sure, as a Muslim traveler, you may not be able to enjoy most of its exotic cuisines sold here. But, you can always go back to the halal restaurants in Bangkok mentioned above to satisfy your hunger! Following is also one of the interesting facts about Thailand that 87% of Muslim travellers don’t know about holidays in Thailand: the best time to plan a trip to this beautiful country is during the festival seasons. There are many festivities celebrated by the locals. One of the famous festivals in Thailand is the New Year and its celebration, known as Songkran. Often falls in April each year, the locals will visit the temples on this day and get onto the street, splashing water to each other. It is a symbol of well-wishing and to get rid of bad lucks. Plus, during Chinese New Year (celebrated in February), Chinatown will also get lively with lion dance performances, cultural street shows, and food festivals! Now that you are well-informed about holidays in Thailand, plan your trip to this beautiful country today and make sure you do one of the suggested activities above – you will not regret it! Do you have any unforgettable memory about your trip to Thailand? Share your experience with us in the comment box below!